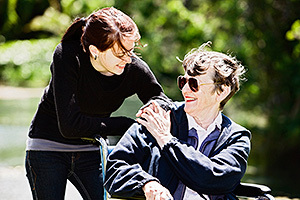 Caring for a family member or friend who has a disability or a chronic illness can be rewarding. But it's also demanding. One of the keys to being a successful caregiver is to manage stress by seeking support and taking care of yourself. Managing stress is especially important for a caregiver, because stress can weaken his or her immune system. A weak immune system makes the caregiver more likely to get sick. Ask family members for help. Include them in caregiving decisions. Share the tasks. Make a list of weekly tasks, and share that list with your family. Ask for help with shopping, housecleaning, and errands. You don't have to do all the work on your own. Stay involved. Make time for social activities and friends, even if it's only a phone call or coffee during the week. Join a caregiver support group. Meeting other caregivers helps you know you're not alone. And it gives you a chance to talk about your worries and concerns with others who understand. Find respite care. Respite services provide someone who can stay with your family member while you get away for a few hours or days. Time away can help you manage your stress and be a better caretaker. Look up caregiver resources in your community. Hospitals, churches, and other groups may provide transportation or other services that support caregiving tasks. You can reduce stress by planning ahead so you know who to call when you need extra help. Put your own health first. Be sure to schedule and go to your medical checkups. Eat a healthy diet, and get enough sleep. Taking care of yourself will help you deal with stressful situations. Get regular exercise. Even a 10-minute walk can relieve stress. Take a breath. Try stress reduction techniques like deep breathing and meditation. Take a break. It's important to take time off from caregiving once in a while. Spend some time doing things you enjoy or on things in your own life that need attention. Depression is common among caregivers. It's emotionally draining to care for a loved one whose health is getting worse. Don't dismiss your feelings as "just stress." If you're having trouble coping with your feelings, it may help to talk with a counselor. If you have symptoms of depression, such as a lack of interest in things you enjoy, a lack of energy, or trouble sleeping, talk with your doctor.